In a press conference today, NASA scientists revealed an extraordinary new discovery – the first known system of seven rocky, Earth-sized planets orbiting a single star. Three out of the seven planets are situated at the perfect distance from the sun to potentially harbor liquid water, making them habitable for life as we know it. This is the largest number of habitable-zone planets ever found around a single star outside our own solar system. It’s important to note that simply because these planets could potentially hold liquid water doesn’t mean that they do – but the likelihood is higher given their location. The planets are orbiting an ultra-cool dwarf star called TRAPPIST-1, located about 40 light years (or 235 trillion miles) from Earth in the Aquarius constellation. 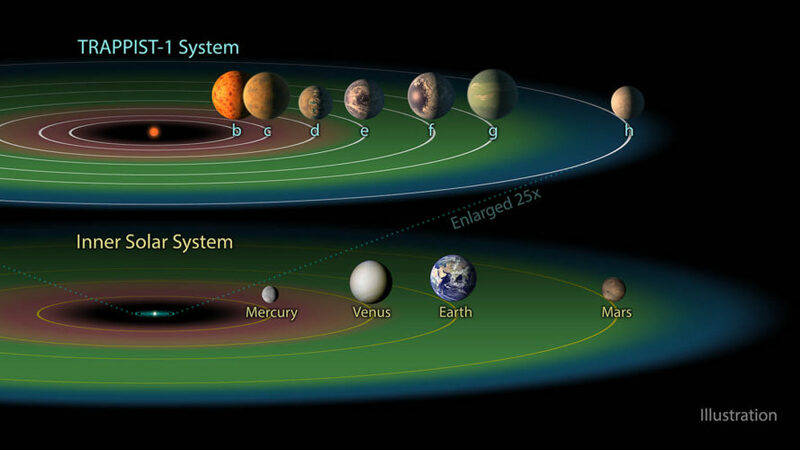 The system is named after the TRAPPIST (The Transiting Planets and Planetesimals Small Telescope), located in an observatory in Chile. In May 2016, TRAPPIST researchers announced they’d discovered three planets in the system. NASA’s Spitzer Space Telescope was able to confirm those exoplanets’ existence and that of four additional planets. The results of NASA’s study have been published in the journal Nature today. What’s especially interesting about the TRAPPIST-1 system is how different its habitable zone is from that of systems like our own. Because the star is much cooler than our sun, planets much closer to the sun than Earth could potentially have liquid water. In fact, all seven of TRAPPIST-1’s planets are closer to the star than Mercury is to our own sun, and each of the planets are so close to one another they would appear in one another’s skies the same way the moon appears in ours. NASA scientists also speculate the planets may be tidally locked, so that the same side of the planet is always facing the star, casting one half of the planet in permanent daylight and the other in perpetual night. This could cause weather patterns unlike anything we’ve ever seen before on Earth, and extreme differences in temperature from one side to the other. The Spitzer telescope was able to detect the presence of the planets by observing the infrared wavelengths emitted by the star over a period of 500 hours. Each time a planet crossed in front of the star, the telescope could detect changes in the star’s brightness. NASA also followed up with a study using the Hubble Space Telescope to determine whether the planets were rocky, or likely had a “puffy” atmosphere like those of our own system’s gas giants. There’s still much about these planets we simply do not know, but studies will continue to help NASA learn more about them. Right now, the Kepler space telescope is also recording observations about the system, which will reveal more properties about the exoplanets in March. NASA’s new James Webb Telescope will also be pointed toward TRAPPIST-1 after its launch in 2018, and will analyze the planets’ temperature, surface pressure, and atmospheric makeup – all key factors that will reveal whether these worlds can actually sustain life. 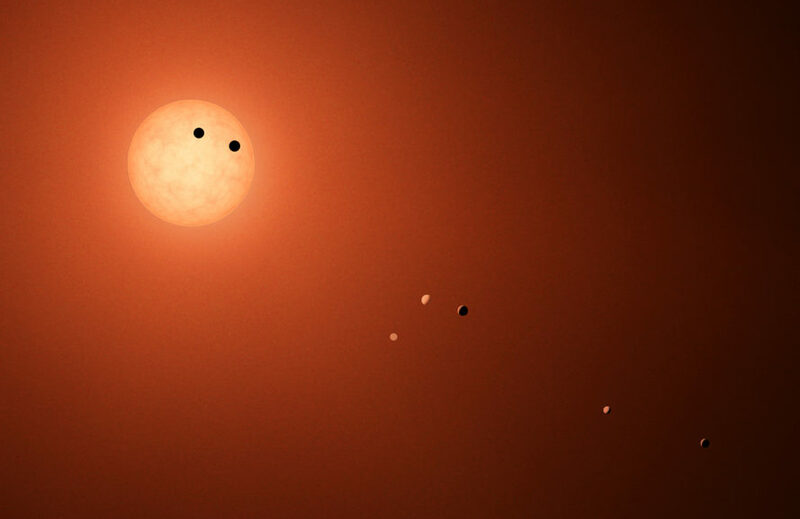 This artist's conception shows what the TRAPPIST-1 planetary system may look like, based on available data about their diameters, masses and distances from the host star. The TRAPPIST-1 system contains a total of seven planets, all around the size of Earth.Three of them -- TRAPPIST-1e, f and g -- dwell in their stars so-called habitable zone. The habitable zone, or Goldilocks zone, is a band around every star (shown here in green) where astronomers have calculated that temperatures are just right -- not too hot, not too cold -- for liquid water to pool on the surface of an Earth-like world. While TRAPPIST-1b, c and d are too close to be in the systems likely habitable zone, and TRAPPIST-1h is too far away, the planets discoverers say more optimistic scenarios could allow any or all of the planets to harbor liquid water. In particular, the strikingly small orbits of these worlds make it likely that most, if not all of them, perpetually show the same face to their star, the way our moon always shows the same face to the Earth. This would result in an extreme range of temperatures from the day to night sides, allowing for situations not factored into the traditionalhabitable zonedefinition. The illustrations shown for the various planets depict a range of possible scenarios of what they could look like. The system has been revealed through observations from NASA's Spitzer Space Telescope and the ground-based TRAPPIST (TRAnsiting Planets and PlanetesImals Small Telescope) telescope, as well as other ground-based observatories. The system was named for the TRAPPIST telescope. NASA's Jet Propulsion Laboratory, Pasadena, California, manages the Spitzer Space Telescope mission for NASA's Science Mission Directorate, Washington. Science operations are conducted at the Spitzer Science Center at Caltech in Pasadena. Spacecraft operations are based at Lockheed Martin Space Systems Company, Littleton, Colorado. Data are archived at the Infrared Science Archive housed at Caltech/IPAC. Caltech manages JPL for NASA. This artist's concept allows us to imagine what it would be like to stand on the surface of the exoplanet TRAPPIST-1f, located in the TRAPPIST-1 system in the constellation Aquarius. Because this planet is thought to be tidally locked to its star, meaning the same face of the planet is always pointed at the star, there would be a region called the terminator that perpetually divides day and night. If the night side is icy, the day side might give way to liquid water in the area where sufficient starlight hits the surface. One of the unusual features of TRAPPIST-1 planets is how close they are to each other -- so close that other planets could be visible in the sky from the surface of each one. In this view, the planets in the sky correspond to TRAPPIST1e (top left crescent), d (middle crescent) and c (bright dot to the lower right of the crescents). TRAPPIST-1e would appear about the same size as the moon and TRAPPIST1-c is on the far side of the star. The star itself, an ultra-cool dwarf, would appear about three times larger than our own sun does in Earth's skies. 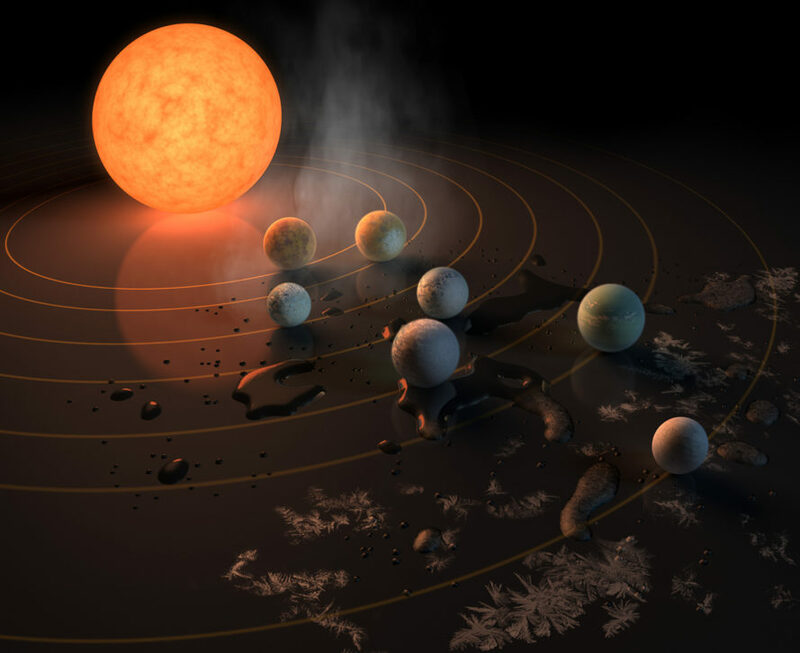 The TRAPPIST-1 system has been revealed through observations from NASA's Spitzer Space Telescope and the ground-based TRAPPIST (TRAnsiting Planets and PlanetesImals Small Telescope) telescope, as well as other ground-based observatories. The system was named for the TRAPPIST telescope. NASA's Jet Propulsion Laboratory, Pasadena, California, manages the Spitzer Space Telescope mission for NASA's Science Mission Directorate, Washington. Science operations are conducted at the Spitzer Science Center at Caltech in Pasadena. Spacecraft operations are based at Lockheed Martin Space Systems Company, Littleton, Colorado. Data are archived at the Infrared Science Archive housed at Caltech/IPAC. Caltech manages JPL for NASA. The TRAPPIST-1 star, an ultra-cool dwarf, has seven Earth-size planets orbiting it. This artist's concept appeared on the cover of the journal Nature in Feb. 2017 announcing new results about the system. This artist's concept appeared on the February 23rd, 2017 cover of the journal Nature announcing that the TRAPPIST-1 star, an ultra-cool dwarf, has seven Earth-size planets orbiting it. 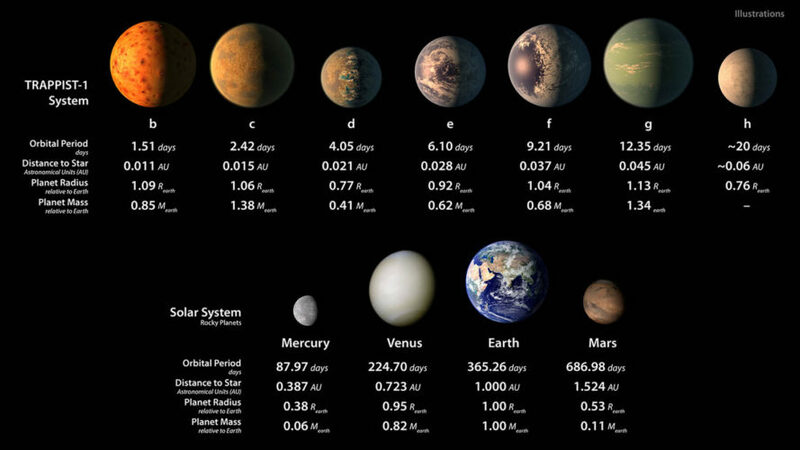 Any of these planets could have liquid water on them. Planets that are farther from the star are more likely to have significant amounts of ice, especially on the side that faces away from the star. The system has been revealed through observations from NASA's Spitzer Space Telescope and the ground-based TRAPPIST (TRAnsiting Planets and PlanetesImals Small Telescope) telescope, as well as other ground-based observatories. The system was named for the TRAPPIST telescope. NASA's Jet Propulsion Laboratory, Pasadena, California, manages the Spitzer Space Telescope mission for NASA's Science Mission Directorate, Washington. Science operations are conducted at the Spitzer Science Center at Caltech in Pasadena. Spacecraft operations are based at Lockheed Martin Space Systems Company, Littleton, Colorado. Data are archived at the Infrared Science Archive housed at Caltech/IPAC. Caltech manages JPL for NASA. This illustration shows the seven TRAPPIST-1 planets as they might look as viewed from Earth using a fictional, incredibly powerful telescope. The sizes and relative positions are correctly to scale: This is such a tiny planetary system that its sun, TRAPPIST-1, is not much bigger than our planet Jupiter, and all the planets are very close to the size of Earth. Their orbits all fallwell within what, in our solar system, would be the orbital distance of our innermost planet, Mercury. With such small orbits, the TRAPPIST-1 planets complete a year in a matter of a few Earth days: 1.5 for the innermost planet, TRAPPIST-1b, and 20 for the outermost, TRAPPIST-1h. This particular arrangement of planets with a double-transit reflect an actual configuration of the system during the 21 days of observations made by NASAs Spitzer Space Telescope in late 2016. The system has been revealed through observations from NASA's Spitzer Space Telescope and the ground-based TRAPPIST (TRAnsiting Planets and PlanetesImals Small Telescope) telescope, as well as other ground-based observatories. The system was named for the TRAPPIST telescope. NASA's Jet Propulsion Laboratory, Pasadena, California, manages the Spitzer Space Telescope mission for NASA's Science Mission Directorate, Washington. Science operations are conducted at the Spitzer Science Center at Caltech in Pasadena. Spacecraft operations are based at Lockheed Martin Space Systems Company, Littleton, Colorado. Data are archived at the Infrared Science Archive housed at Caltech/IPAC. Caltech manages JPL for NASA. This chart shows, on the top row, artist concepts of the seven planets of TRAPPIST-1 with their orbital periods, distances from their star, radii and masses as compared to those of Earth. On the bottom row, the same numbers are displayed for the bodies of our inner solar system: Mercury, Venus, Earth and Mars. The TRAPPIST-1 planets orbit their star extremely closely, with periods ranging from 1.5 to only about 20 days. This is much shorter than the period of Mercury, which orbits our sun in about 88 days. The artist concepts show what the TRAPPIST-1 planetary system may look like, based on available data about their diameters, masses and distances from the host star. The system has been revealed through observations from NASA's Spitzer Space Telescope and the ground-based TRAPPIST (TRAnsiting Planets and PlanetesImals Small Telescope) telescope, as well as other ground-based observatories. The system was named for the TRAPPIST telescope. The seven planets of TRAPPIST-1 are all Earth-sized and terrestrial, according to research published in 2017 in the journal Nature. TRAPPIST-1 is an ultra-cool dwarf star in the constellation Aquarius, and its planets orbit very close to it. NASA's Jet Propulsion Laboratory, Pasadena, California, manages the Spitzer Space Telescope mission for NASA's Science Mission Directorate, Washington. Science operations are conducted at the Spitzer Science Center at Caltech in Pasadena. Spacecraft operations are based at Lockheed Martin Space Systems Company, Littleton, Colorado. Data are archived at the Infrared Science Archive housed at Caltech/IPAC. Caltech manages JPL for NASA. The first observations of the TRAPPIST-1 system reported in 2016 revealed three planets orbiting a small, red-dwarf star, though the exact location of the outermost one, was not well-determined (yellow band, top image). Follow-up observations with NASA's Spitzer Space Telescope, as well as ground-based telescopes, dramatically changed our understanding of this system, revealing a total of seven planets in Earth’s size range. The original TRAPPIST-1d was found to have actually been the mixed-up signals of three other planets e, f, and g (yellow orbits, bottom image), and an entirely new d and h were also added to the system. NASA's Jet Propulsion Laboratory, Pasadena, California, manages the Spitzer Space Telescope mission for NASA's Science Mission Directorate, Washington. Science operations are conducted at the Spitzer Science Center at Caltech in Pasadena. Spacecraft operations are based at Lockheed Martin Space Systems Company, Littleton, Colorado. Data are archived at the Infrared Science Archive housed at Caltech/IPAC. Caltech manages JPL for NASA. 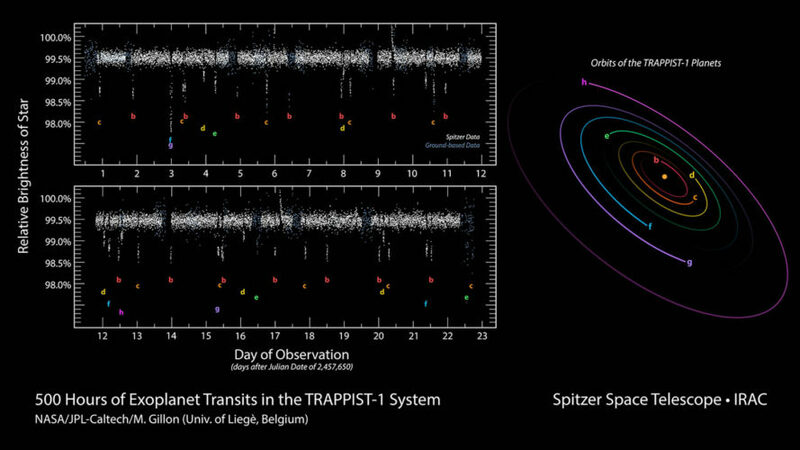 This data plot shows infrared observations by NASAs Spitzer Space Telescope of a system of seven planets orbiting TRAPPIST-1, an ultracool dwarf star. Over 21 days, Spitzer measured the drop in light as each planet passed in front of the star. 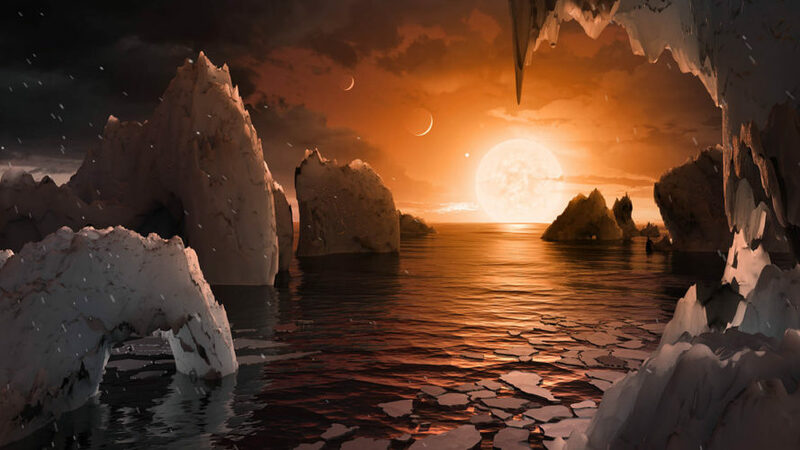 Spitzer was able to identify a total of seven rocky worlds, including three in the habitable zone where liquid water might be found. This plot shows the change in light as each planet passes in front of its star. A diagram of the layouts of the orbits is shown on the right. The study established the planets' size, distance from their sun and, for some of them, their approximate mass and density. It also established that some, if not all, these planets are tidally locked, meaning one face of the planet permanently faces their sun. The system has been revealed through observations from NASA's Spitzer Space Telescope and the ground-based TRAPPIST (TRAnsiting Planets and PlanetesImals Small Telescope) telescope, as well as other ground-based observatories. The system was named for the TRAPPIST telescope.